Sudan: As protests against the cost of living and the authoritarian government sweep across Sudan, protesters have been killed, injured, arrested and arbitrarily detained by Sudanese police and security forces.. LRWC calls on Sudan to haltt the excessive use of force, respect the right of people to peacefully voice their concerns and to release Mr. Salih Osman and others. I write on behalf of Lawyers Rights Watch Canada (LRWC), a committee of lawyers and other human rights defenders who promote human rights and the rule of law internationally through advocacy, research and education. LRWC has Special Consultative status with the Economic and Social Council of the United Nations. LRWC is concerned by reports of the repression of peaceful public demonstrations across the Sudan. 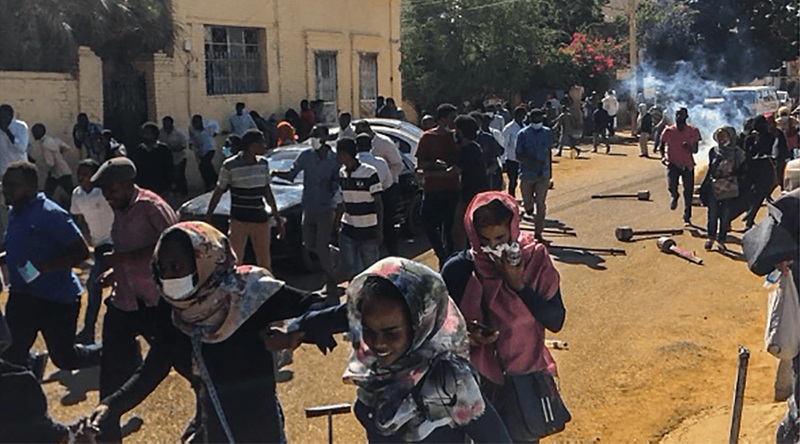 The protests began in Atbara on or around December 19, 2018 and have since spread to other towns including Omdurman, Um Rawaba, Gadarif, El Obeid, Wad Madani, Port Sudan, Dongola, El Fasher and Khartoum. Demonstrators are protesting the rising cost of living and calling for an end to the current authoritarian regime. According to news reports, security forces have used excessive force to disperse unarmed protesters, including beating them with batons and firing live ammunition, rubber bullets, and teargas. Scores have been killed and hundreds have been severely injured, arrested and arbitrarily detained, including many lawyers and human rights defenders. In particular, we note that, according to a motion tabled in the European Parliament on January 15, 2019, Mr. Salih Osman, a Sudanese human rights lawyer and Sakharov Prize Laureate of 2007, was arrested in his law office on January 8, 2019. Government authorities have confirmed that he is in custody but have not disclosed where he is being held. LRWC is deeply concerned by the failure of Sudanese authorities to uphold its international law obligations to respect the rights to peaceful assembly and association with others. The International Covenant on Civil and Political Rights (ICCPR), to which Sudan is a State Party, prohibits restrictions of the right to peaceful association and assembly (Articles 21 and 22), other than as specifically allowed. The ICCPR (Article 19 (3)) allows only restrictions that are provided by law, necessary and proportionate to ensuring respect for the rights or reputation of others, or/and, protecting national security or public order. Similarly, the African Charter on Human and Peoples’ Rights (Banjul Charter) to which Sudan is a State Party, guarantee the rights to freedom of association and assembly (Articles 10 and 11) and prohibit restrictions on those rights other than as specifically provided (Article 27(2). None of the circumstances allowing State Parties to impose restrictions under either the ICCPR or the Banjul Charter are present in this case. Peaceful protests are a fundamental aspect of a vibrant democracy. States should recognize the role of protests as a means to strengthen human rights and democracy. They should guarantee the right to freedom of peaceful assembly freedom of association, freedom of opinion and expression, which are essential components of democracy and indispensable to the full enjoyment of human rights. Release detainees, including Mr. Salih Osman, and put an end to all arbitrary restrictions of assemblies for peaceful protests and demonstrations. Carry out an immediate, thorough and impartial investigation into all reported killings, injuries and other abuses, and justice for the victims and the remedies required by law including by the International Covenant on Civil and Political Rights and the African Charter on Human and Peoples’ Rights. Conform with the provisions of the ICCPR and the Banjul Charter including provisions guaranteeing rights to expression, assembly, association and to participate in protest. .
 “Effective measures and best practices to ensure the promotion and protection of human rights in the context of peaceful protests Report of the United Nations High Commissioner for Human Rights.”, Report of the UN High Commissioner of Human Rights, 21 January 2013, A/HRC/22/26 at para. 9.